This is the aquafaba version of my Fresh Flax Pasta. I'm not sure it's any better than the original, but it is durable yet tender and tasty. The trick here is to add flour as needed when you are rolling out the dough. The final product should be smooth and satiny, not tacky at all. This is most important if you are cutting the dough into thin noodles with a pasta cutter. 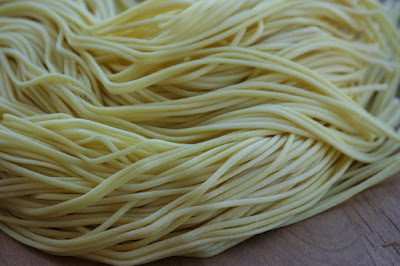 It is a little less important if you are cutting the dough by hand into broad noodles. Give the noodles a good drying before you cook them. 1. Whisk together flour and salt in a large bowl. Make a well in the centre. 2. Mix turmeric into the soy milk. Pour into the well in the flour. Add aquafaba and oil. Bring together into a dough (I do this with a dough hook in my stand mixer). Add more soy milk if absolutely needed. 3. Roll into a log and wrap in plastic. Let rest 20 mins. 4. Roll out, flouring as needed, and cut as desired. Let dry before cooking. This pasta cooks very quickly--just a minute or two and it's done.